Over the course of five years of scientific writing and editing assignments, I have also developed, designed, and produced various complex conceptual illustrations of hypothesized cell signaling mechanisms, finished in Adobe Illustrator. These are illustrations designed and produced by the same person who wrote or edited the manuscript--a rare combination. You don't need to spend your valuable time giving directions to the artist/designer. The content is clear and accurate from the first draft. No prior sketches needed. As of September 2014, one of the scientific illustrations that I've been commissioned to produce in final form for journal submission has been published (see below and left). Another was orginally scheduled to appear in the Journal of the National Cancer Institute Monographs in October 2012, but has been delayed for two years. A version containing selected components of that illustration appears in the Journal of Dental Research, Sept 2014. The table below lists commissioned figures, along with a link to one publicly available figure that I designed from scratch, and for which I wrote the legend, but did not produce the final artwork. It gives a good idea of the type of illustrations I produce. in 4 parts, commissioned from Stephen Arthur. 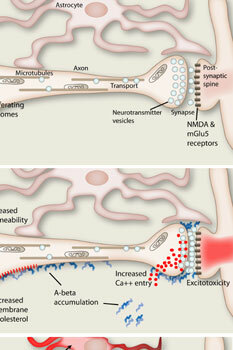 in: CNS Neurol Disord Drug Targets. 2014; 13(4) (see thumbnails for figure) McGill U. Health Center Research Instit. Copyright © SXA Stephen Arthur 2019. Site by Stephen Arthur in basic HTML.